with extra white added to about 10 per cent. I painted some on a section of primered alloy and then they matched it. 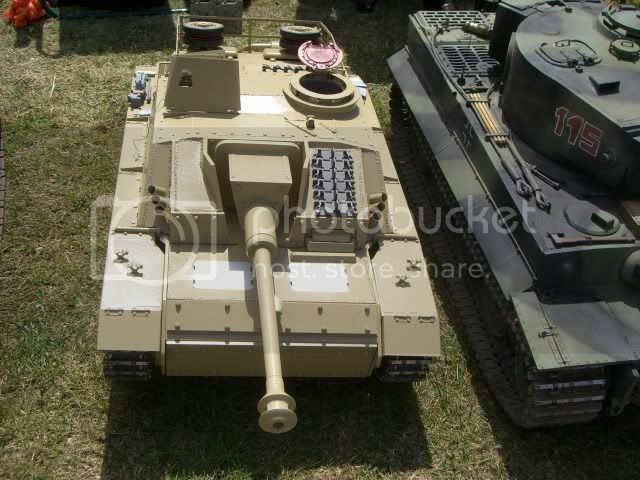 I had it mixed for the Panther and there was a load left so I have used it on my Stug. I am happy with the shade. Went to Wings and Wheels with Robin and others form the Tank club. 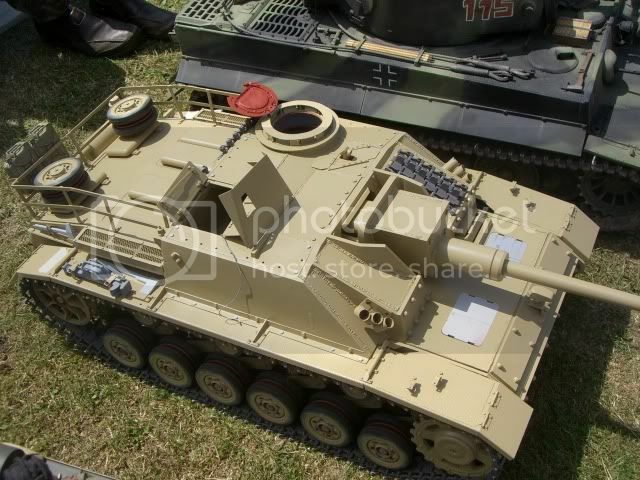 Very hot both days and I had the Stug with its first proper run. 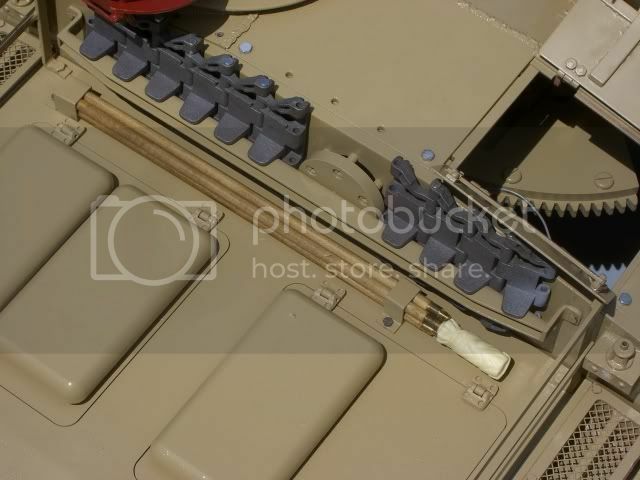 I have not got the cammo done but I have added some new parts like the gun cleaning rods here are some photos. 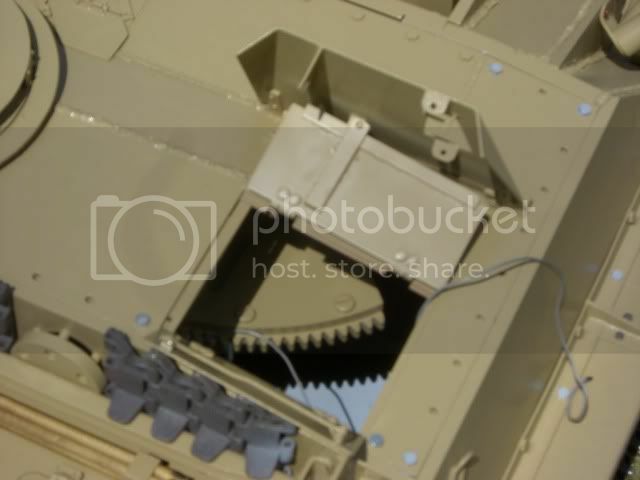 I had a problem while running at Wings an Wheels I had the Stug on 40 meg radio (Futaba) with the new motion pack. 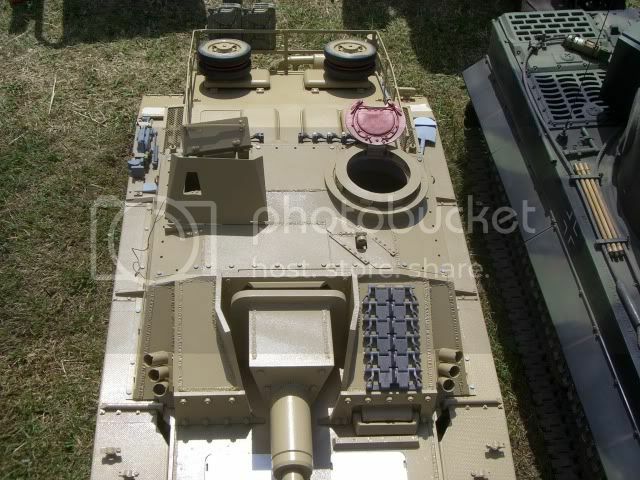 When running forward in a straight line pushing both sticks forward the stug took off in a large ark. 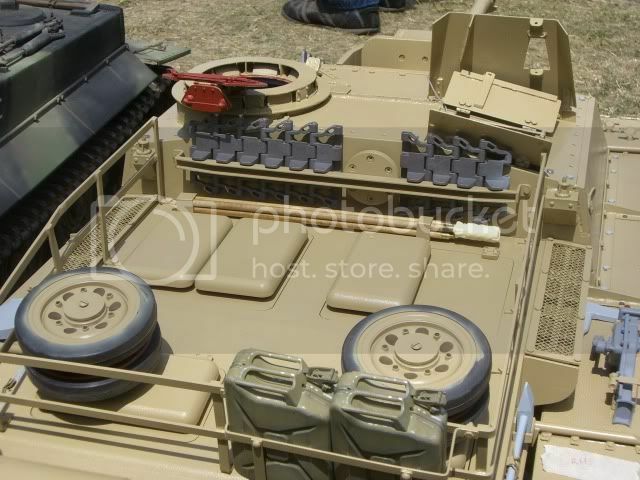 We then changed the the two receiver leads for speed control and with the sticks fully forward the stug took off in an ark to the other direction. I think there is a miss match in the speed control board. I wonder is there some setting on the speed control. Please note all trims were in neutral. Should the new motor pack work with all types of radio not just 2.4 meg sets.? I have bought a 2.4 Futaba 7C set for other reasons which I will fit but I would like to understand this problem. 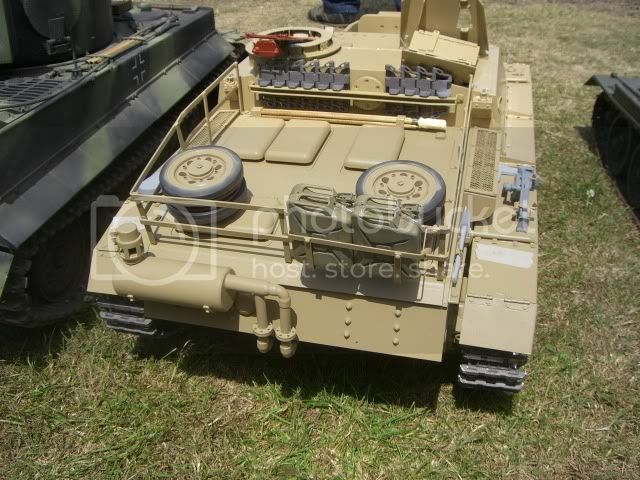 The tank is really smooth running on its tracks and I am very happy over all. I would have thought that pointed the finger at the transmitter/receiver rather than the speed control board. Do you have a spare servo you could attach to each channel in turn and see if you get the same deflection from each of the channels on the receiver, when the stick is pushed fully forward ? The 6EX range have a "factory reset" facility of each model stored so that you clear any strange settings for that model. I especially like the color. The Stug looks brilliant, having the base coat a little lighter is a good thing as it will definitely darken up when any weathering or other paint effects are added. As Adrian says, it does sound like the problem is with the radio gear and with one channel. I'm not sure, but can the steering trims affect the end points? It might also be worthwhile checking the end point adjustments as this could affect it as well. You could try setting it up again from a spare model memory. 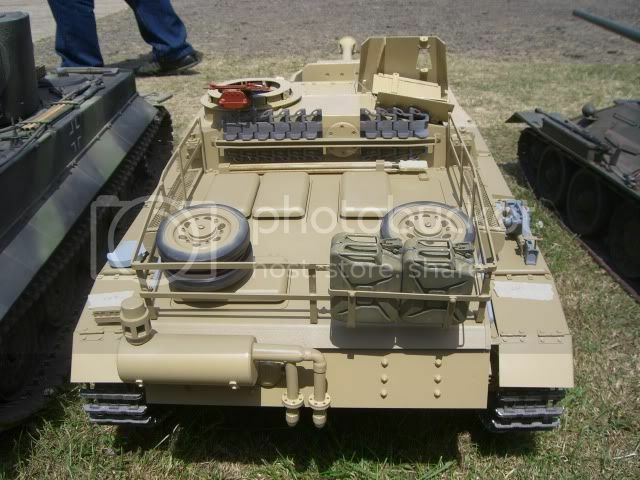 I'm looking forward to seeing it at the Armortek open day. for many years and I tried it last night with servos and all is fine. it is a basic skysport 4. The trims are all set to center zero no other adjustments available. 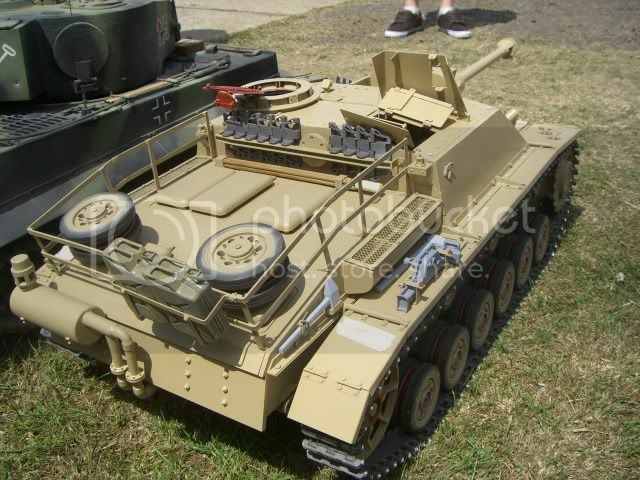 sorry carnt help with the track problem ,but would just like to say how mutch i like your stug it is a favourite of mine well done ,carnt wait to see it with camo on it ,and i would like to see a side profile picture as well. a unique build and looking very good, you must be pleased it came out so well. 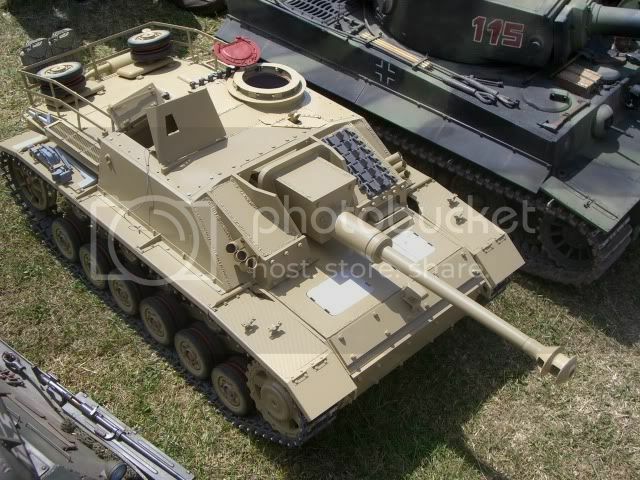 look forward to seeing the stug , regards simon manning. I am really happy with the way it has come out. I am still in the middle of a long drawn out house move so the cammo will have to wait. I have lots of other extras to add once the paint is finished. 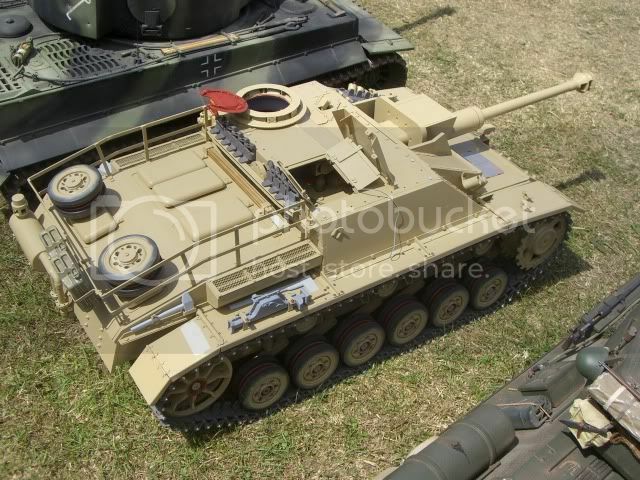 A friend sent me this link to a Stug site which I've not seen before. Are you getting any time on your Stug? Wings and Wheels I am moving on the 30th so the workshop is all in boxes at the moment and the models go into secure storage tomorrow night so I don't have to move them on the day. on the drive motors. as you can tune the ratios on the handset.